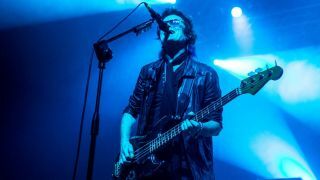 After the painful, very public deaths of Black Country Communion and California Breed, Glenn Hughes is back in solo mode and ready to roll his pretty damn huge world tour into the UK this October. "It is very clear to me that going back to my solo work is the way that it is supposed to be now," he says. "I really truly don't have a lot of time to form a band and then something goes wrong and you have to go back to the drawing board and start again." Glenn may be back solo, but he's bringing a familiar face out with him. With The Voice Of Rock's usual guitarist Soren Andersen already booked up, former Whitesnake man Doug Aldrich will be in tow when Glenn makes it to the UK. "I thought about it for a split second," says Doug of the decision to take the gig. "I just said, 'Yup, let's go.'" Doug reveals that he has a host of guitars that would work a treat for the tour - his '69 Strat and '57 Les Paul Junior are the frontrunners - as he searches for a less in-your-face tone than the one he blasted in arenas the world over with Whitesnake for more than a decade. "With Whitesnake, David was always pushing for a super heavy sound," he says. "He wanted big, big, big. I'm excited about the freedom of having a cleaner sound that is still aggressive and punchy." So, bar Doug's cleaner tone, what can fans expect from a 2015 Glenn Hughes solo show? A whole lotta rock, by the sounds of it. "It's going to be a historical tour from me," says Glenn. "Rock fans will get the chance to hear some of their favourite rock tracks that I wrote. It's going to be what people would want to see from Glenn Hughes. I've put my rock hat firmly back on and I've hired Doug Aldrich. Let's be clear, he's a hard-rock guitar player: he's not Prince, he's Doug Aldrich. I have gone back to full-on rock." Yup, Glenn's gone full-on rock, and he's got the setlist to back it up. "I've been writing songs for four-and-a-half decades, I've published over 400 songs. There's a lot to choose from. What I want to do is touch base with a couple of Deep Purple songs, couple Trapeze, couple Black Country, a little California Breed and some Glenn Hughes solo material." And it doesn't end there. Get yourself a ticket and you'll not just get Hughes and Aldrich, but also fresh-faced bluesman Jared James Nichols, who provides support throughout the tour. "The amount of influence Glenn has had on me as a musician is gigantic," says Jared. "In addition, Doug Aldrich will be on guitar! This will absolutely be a tour for the books. I'll be going full-throttle at every show to fire up the crowd. I can't wait to hit the road with Doug and listen to him shred every night. Hopefully, we'll be able to jam together, too!"